As the 2013 Atlantic hurricane season comes to a close, it may be easy to dismiss the significance of this yearÃ¢â‚¬â„¢s season. While itÃ¢â‚¬â„¢s true that this year had the fewest number of hurricanes since 1982, the 2013 hurricane season was only the third below-normal season in the last 19 years, since 1995, when the current high-activity era for Atlantic hurricanes began, according to forecasters. A total of 13 named storms formed in the Atlantic basin this year, NOAA reports, but only two, Ingrid and Humberto, became hurricanes. Neither of these storms became a major hurricane (Category 3, winds of 111-129 mph and above). Meanwhile, the Insurance Information Institute (I.I.I.) and the Florida Insurance Council (FIC) remind us that while Florida has escaped hurricane damage for eight consecutive years, insurers are prepared for the stateÃ¢â‚¬â„¢s severe weather history to repeat itself. Check out I.I.I. facts and statistics on hurricanes. 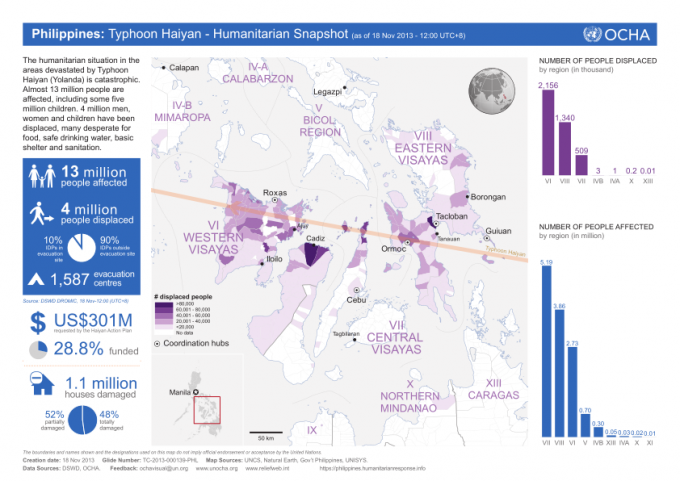 More than a week since devastating Typhoon Haiyan hit the Philippines and greater clarity is starting to emerge on the numbers surrounding this disaster. 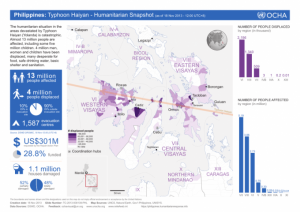 A November 18 report from the United Nations Office for the Coordination of Humanitarian Affairs notes that Typhoon Haiyan affected an estimated 13 million people in nine regions. The latest government figures estimate that over 4 million people have been displaced, of whom 392,470 are living in 1,587 evacuation centers in six regions, mainly in Western and Eastern Visayas regions. The Wall Street Journal reports that Typhoon Haiyan caused at least 3,982 fatalities, injuring 18,266 people. An additional 1,602 people are missing. An updated report from Guy Carpenter notes that according to Joint Typhoon Warning Center (JTWC) advisories, Typhoon Haiyan meets or surpasses the intensity of the strongest landfalling tropical cyclone in recorded history: Hurricane Camille (1969) which made landfall on the U.S. Gulf Coast as a devastating 190 mph (305 km/h) hurricane. Catastrophe modeler AIR Worldwide reports that the islands of Leyte, Samar, and northern Cebu are among the worst affected areas. Tacloban City, the capital and biggest city (population of 220,000) of Leyte province was particularly hard hit as storm surges as high as 4 meters destroyed every coastal home and left many inland neighborhoods inundated with floodwaters. As for the cost to insurers, AIR Worldwide estimates industry-wide insured losses of between $300 million and $700 million. Due to low insurance take-up, this is a small proportion of the total damage to residential, commercial and agricultural property which AIR Worldwide estimates at between $6.5 billion and $14.5 billion. Amid the pictures and stories of destruction from Typhoon Haiyan come some facts that put the damage from this storm in perspective, at least in insurance terms. 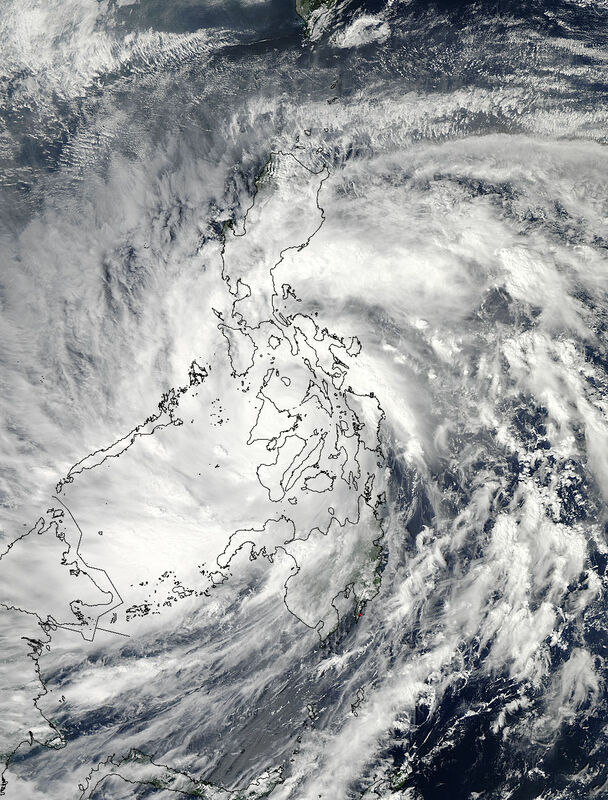 Typhoon Haiyan hit the central Philippines as an extreme Category 5 storm, with winds of 195 miles per hour as well asÃ‚ a massive storm surge on November 8. It then traveled across the South China Sea and made landfall on the north Vietnam coast as a Category 1 storm with 75 mile per hour winds on November 10. Latest media reports put the death toll in the city of Tacloban alone at more than 10,000. While this figure seems high, the Capital Weather Gang blog notes that even if the death toll estimate holds up Haiyan would rank outside the top 35 deadliest tropical cyclones on record. For comparison, the most deadly tropical cyclone on record was the Great Bhola Cyclone that claimed 300,000-500,000 lives in Bangladesh in November 1970. According to Swiss Re sigma statistics, Haiyan may also fall outside the top 25 worst catastrophes in terms of victims (1970-2012). Insurance industry experts predict that while the economic impact of Typhoon Haiyan will be significant, insured losses are likely to be low. AIR Worldwide reports that the economic cost of the typhoon is expected to be the highest from a natural disaster in the PhilippinesÃ¢â‚¬â„¢ history, although only a small portion of it is expected to be insured. Officials suggest more than two million families (nearly 10 million people) have been affected by Haiyan in the Philippines, with more than 650,000 people displaced, AIR Worldwide adds. Dr. Robert Hartwig, president of the Insurance Information Institute (I.I.I.) notes that the Philippines is a very small market for property/casualty insurance, with premiums written in 2012 of just $1.23 billion. On a per capita basis, this works out to just $12.70, compared with $1,223.90 in the United States. Another reason why insured losses may be nominal, Dr. Hartwig says, is that the storm did not make a direct hit on Manila, the capital and largest city in the Philippines. The I.I.I. reports that prior to Haiyan, the strongest storm to hit this region was Super Typhoon Megi in October 2010, which impacted the Luzon region. Insured losses for that storm were estimated at less than $150 million. The percentage of companies buying cyber liability insurance is increasing substantially, according to an annual survey jointly produced by Advisen and Zurich. For the first time in the three years that the survey has been administered, more than half of respondents claim to purchase cyber liability insurance. In response to the question Ã¢â‚¬Å“Does your organization purchase cyber liability insurance?Ã¢â‚¬  some 52 percent responded yes, compared to 44 percent in 2012, and 35 percent in 2011. Only 38 percent said their organization did not purchase this protection, down from 50 percent in 2012 and 60 percent in 2011. Of those companies that do purchase coverage, some 72 percent have done so for more than three years. This represents a 10-point increase from 2012 suggesting that when organizations purchase the coverage they see enough value to renew it year after year. Even those companies that have not bought cyber coverage are thinking about it. Half (53 percent) of survey respondents that do not currently buy cyber insurance are considering purchasing it in the next year Ã¢â‚¬“ a 28 percentage point increase from 2012. Check out a recent I.I.I. paper on cyber risks.